No bruising reactions. The pores slowly turned to a brownish something-or-another color in the ones I brought home. They described as turning brown, or not bruising when mature. The flesh remained white. White reticulation on the upper portions of the stem, browner lower down. 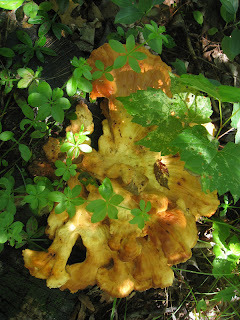 The stem peels in the older mushrooms, as in the photo below. This mushroom also strongly resembles a Tylopilus bolete, but mushrooms of that genus tend to taste bitter (sometimes extremely so), and have spore prints on the reddish side of brown; this mushroom tasted very mild and had a brown spore print on the olive side of things (I find trying to discern the various shades of brown spore prints to be a bit frustrating and very subjective). Note: B. reticulatus is a European mushroom. The cf. 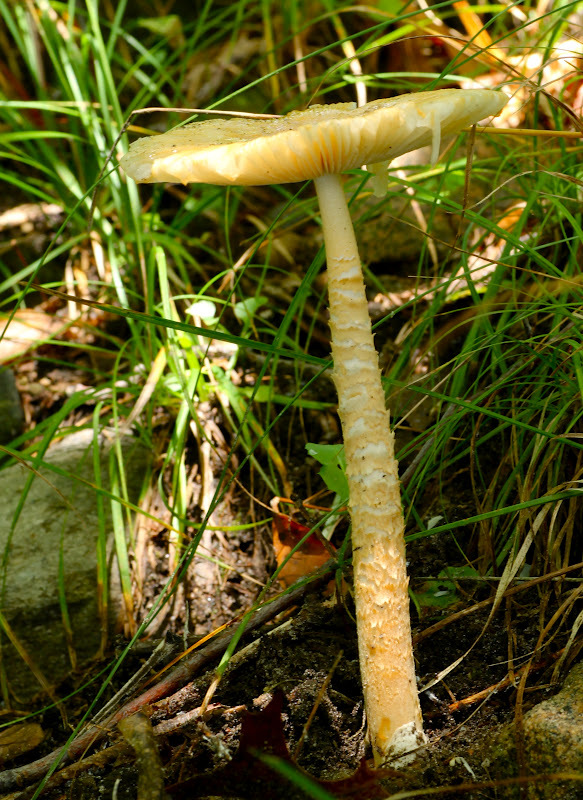 in the name means this mushroom resembles B. reticulatus, but may actually be a different species. Also note that when I first posted this mushroom, I misidentified it as B. variipes (and I could have misidentified it yet again). Orangish colored cap. The margins of the cap are lined, with a darker center. The surface was a bit viscid. Gills free from the stem, visible in the mushroom pictured to the right, which is an older specimen. A sac-like cup (volva) at the base of the stem, which I had to dig around to make visible. This one is past it's prime, but I found another one that's going to be cooked into a curry noodle dish with tomatoes from the garden. I was going for some creative lighting effect. What do you think? These are well past their prime, but I thought they looked interesting. The tough, wiry stem is a good clue that these mushrooms are a species of Marasmius. They have a definite garlic smell, and can be used to add flavor to dishes. 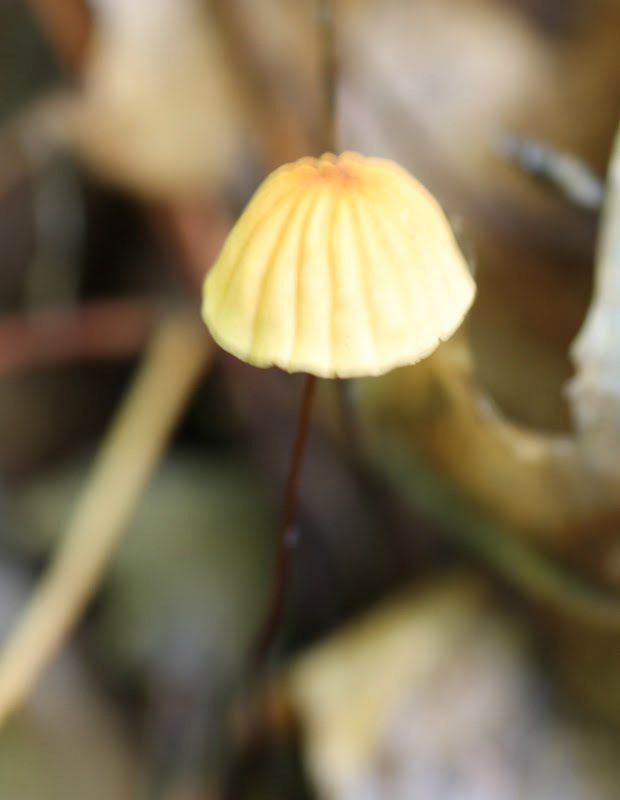 Again, the tough, wiry stem indicates a species of Marasmius. And the small size. This one seemed to float above the dead leaves and twigs on the ground.